This beer bar serves only the finest craft beers on tap from around the world and has developed a loyal following of clients who crave both great beer and lots of fun. It is located in the heart of the West San Fernando Valley. To keep it interesting and to draw people back, the owner changes the beer selection on a regular basis. In fact the beers change so much you can join the beer lovers club where you try 80 beers in 80 days and you get your own personally engraved mug and are now "IN THE CLUB." This bar was voted one of top 10 Craft Beer Bar's in Los Angeles. There are also many bottled Beers to choose from as well. So you are SURE to find a beer that matches your personal taste. With approx. 1,000 likes on facebook and a ever growing twitter following it makes it easy to reach your guests with the New Beers being offered on tap or any other special promotions you may be having coming up. Then the Yelp reviews just keep coming in, at 4 1/2 stars clearly the guests just LOVE this place. So let the Fun begin as you gather in what has been voted one of LA's favorite places to enjoy Trivia. These nights have exploded as a place to enjoy an evening with friends and strangers alike. Or enjoy a game of darts as you savor that new beer on tap. This has been operated as an Absentee Owner business where a working owner at present sales could make themselves a take home of $40 - $55K. Also with an owner working the place sales could even increase by having a hands on business (as no one quite does it like the owner). Present owner only stops by occasionally to be sure the place is being kept clean and inviting for the guests and work on the next promotion or event. Operating hours are very short with the opening hours daily of 5PM and closing between 11PM and 2AM depending on the day of week. New owner can capitalize on increasing the hours to include the sports games on weekends as well and other events. The place is very limited on the food being served as there is no "Kitchen" per se but there is a steamer and microwave to prepare the items that are being offered. Employee overhead is very small as only one person is needed to run the business. With rent of $1,275 a month approx 8% of sales helps the bottom line profits coming in. So to get more information, name, address and pictures just go the the Sign NDA tab below. 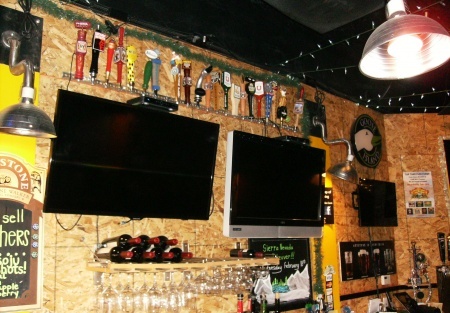 Visit us at SellingRestaurants.com to see our other bars as well. You just won't beleive this place till you visit it! !